MEMBERS (L-R) – Back Row: LARRY ZIMDAHL, JENNIFER WATKINSON, JERRY BROCK, PAT ZIMDAHL and FRED MEISER; Front Row: KATHY WENNDT, COLENE BROCK and MISTY WUEST. We are the Worship and Praise team that has been leading contemporary style worship at Faith on Saturday nights for over 15 years. We enjoy spreading the news of our Lord in the community in a variety of ways. We love singing with the kids during our Vacation Bible School programs. 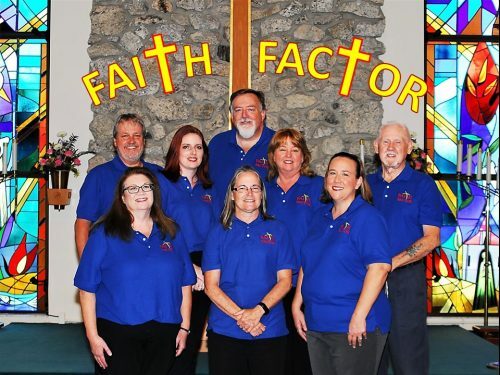 Every year we also enter a float in the New Port Richey Christmas Parade, we are one of just a couple of bands that play live christian music through the town…. In the Spring we delight in helping folks at Timber Greens Golf Course welcome Easter morning with a Son Rise Service… it is a beautiful sight as we help lead worship early in the morning and we see the sun rise over the pine trees. We also play regularly at the Oasis Coffee Spot, a local christian coffee house. All of these are wonderful opportunities for the team to share the love of Christ with our neighbors and friends. Now, we are making preparations for our second FAITH FACTOR cruise, leaving here from Faith, in March of 2019 (details and brochure elsewhere on the site). And beginning in the Fall of 2018, we begin sharing music on worship on Sundays (instead of just Saturdays). 1 PRAISE THE FATHER PRAISE THE SON. 3 COME, NOW IS THE TIME TO WORSHIP.